Whenever we’re on a grocery run, my wife always has to remind me to check out the cost per unit—the figure that helps you compare the prices of different quantities of the same goods to ensure that you’re getting the most for your money. Often times, stores will helpfully print out that information on the price tag; some times, they do not. Apples2Oranges is for those times they do not. The $5 utility from Ilium Software lets you compare the prices of different quantities of the same product. The example Ilium Software uses on its App Store page is two separate sizes of vitamins—a $5.99 bottle containing 78 vitamins and a $4.99 bottle containing 56 pills. Apples2Oranges can help you calculate that the 78-pill bottle is the better buy even though it costs $1 more because you’re paying less per item. 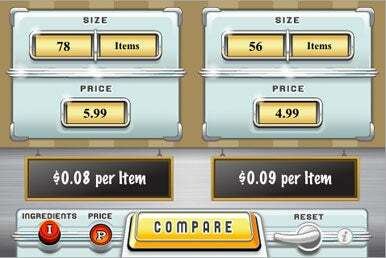 In addition to comparing prices of different quantities of an item, Apples2Oranges also can compare different units, such as meters and feet. And the app compares nutritional information as well, telling you how many calories are in different-sized servings. Apples2Oranges works with any iPhone or iPod touch running the iPhone 2.x software update. Sketches, from LateNiteSoft: The 1.5 version of the $5 drawing application adds several user-suggested features such as the ability to select color opacity, improved control of stroke width selection, and a new hosting service for sharing drawings. iStat, from Bjango: The $2 system monitoring app offers iPhone stats for memory, disk space, and uptime and load averages among other data as well remote Mac monitoring capabilities. DialByPhoto, from Gx5: The $2 contact management tool lets you call, e-mail, or text message your contacts by tapping their photo or icon. Self Portrait, from John Moffett: The $1 app lets you take self portraits by tapping anywhere on the iPhone’s screen and preview images before saving them onto a photo roll. iViz, from Living Liquid Software: The $1 visualizer includes four different 3-D visual effects that play as you enjoy music on your iPhone or iPod touch. Saunders Q&A Review for the NCLEX-RN Examination, from Modality: The $40 study aid is aimed at preparing students for the National Council Licensure Examination for Registered Nurses. Lovetricity, from Splaysoft: The $2 novelty app tests the level of chemistry between you and your would-be paramour with just the touch of a thumb.